This artist's impression illustrates how high-speed jets from a supermassive black hole would look. This image taken with the NASA/ESA Hubble Space Telescope shows a selection of galaxies used in a survey aimed at confirming the link between galaxy mergers and high-speed jets from supermassive black holes. On the left (top to bottom) are the galaxies 3C 297 and 3C 454.1, on the right is 3C 356. 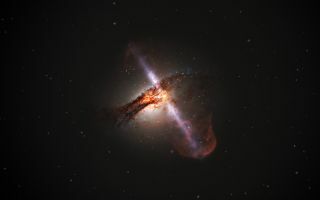 This image taken with the NASA/ESA Hubble Space Telescope shows the galaxy 3C 297, which was part of a large survey of galaxies that sought to confirmed the link between mergers and galaxies hosting relativistic jets from supermassive black holes.